Shopping for school supplies was always one of my favourite parts of September, and although my tastes are more Kate Spade than Kaboodles these days, not much has changed, I'd say: pretty stationery and workspace objets still set my heart racing. Here are my picks for making your work/study life lovelier, happier, and—dare I say it—more productive. 1. Backpacks may be having a moment, but a tote is still the classic, office-appropriate choice for most adults. The Longchamp 'Le Pliage Neo' tote in black ($205.71) is sleek, sturdy, water-resistant, light as a feather—the perfect bag for lugging home your laptop and papers in Vancouver rain, really. 2. I love the versatility and heft of these Anthropologie monogram mugs ($8). You can drink your coffee out of one, sure, but it also makes an adorable personalized pen holder or a succulent planter. 3. Vintage brass pineapple bookends add a glam touch to a girl's desk while keeping notebooks and papers upright. 4. Zippered pouches keep pens and purse essentials from migrating into a mess at the bottom of your roomy tote. The good news? You don't have to spend a lot for a bright and cheerful number, like this Forever 21 C'est La Vie cosmetic bag ($6.80). 5. When I get into a good work groove, I don't want to interrupt it searching for lip balm; that's why I always keep some on my desk. AERIN Rose Lip Balm ($66.28)—with its formula containing 350 rose petals, bright pink hue, and gold-capped jar—is just as beautiful as it is effective. 6. With their gold and cream stripes, these Kate Spade gold stripe file folders ($16) are far from mundane manila. 7. Keep a tray like this J. Crew ceramic jewelry tray ($22.50) close by to corral loose paper clips, SD cards, and any jangling jewelry you want to shed as you type. 8. Major deadline? Soothe your nerves with a few aromatherapeutic swipes of Aveda stress-fix concentrate ($24) on your wrists and under your nose and take some deep breaths. The rollerball vial is compact and easy to use. 9. A scented candle helps set the mood for a long-haul study session. This Voluspa Santiago Huckleberry small tin candle ($13) delivers and looks pretty on your desk without taking up too much room. 10. Medium ballpoint pens with good ink flow are an obsession of mine, and Poppin makes some of the best around in cheery colours to suit any desk decor. Don't you love the new mint Poppin pens ($14)? 11. Along with lip balm, yummy-scented hand lotion is another deskside necessity. Lately I've been favouring Gud by Burt's Bees Floral Cherrynoval Natural Body Lotion ($7). Affordable and free of parabens, phthalates, and petrolatum, with a floral fragrance developed by a French perfumer...what's not to love? 12. Whether you need motivation or simply some decor for blank walls, this Work It print ($15) is apropos. I also always get that feeling, love it, almost wish I could go back to school. LOve the bag, use mine always. I have the regular Longchamp Le Pliage in dark grey, but love the sleekness of the all-black version. Hehe I have these file folders myself. $16 is a small price to pay for feeling so fancy! New mugs and candles are such a great pick-me-up. #2, #4, and #7 - be mine! 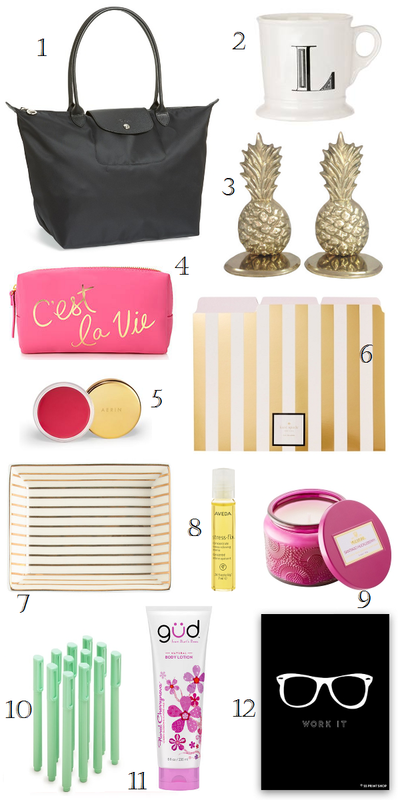 Seriously coveting #7 for myself! I've loved those Kate Spade folders for-like-ever. I need to go get them. And I LOVE that jewelry tray!